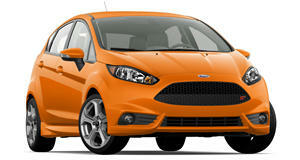 Could the upcoming Ford Fiesta ST be the perfect combination of fun, affordability and efficiency? We'll know soon enough. The upcoming Ford Fiesta ST has been in the news a lot lately, namely because of its hot performance numbers and its bargain price tag. But as the little hot hatchback gets closer to its fall arrival in showrooms, additional information is coming to light indicating the Fiesta ST may just turn out to be one of the best new cars in years. In addition to its 1.6-liter turbo four punching out 197 horsepower and 214 lb-ft of torque, a Ford spokesman told USA Today that it’s predicting the Fiesta ST will return 26/35 mpg city/highway for an average of 29 mpg. When compared to its direct competitors, such as the Fiat 500 Abarth and the Chevrolet Sonic RS, the Fiesta ST once again shines due to its 136 mph top speed and a $21,400 base price before destination charges. For some additional mouth-watering comparison, the Mini Cooper John Cooper Works produces 208 hp, but it costs at least $8,000 more. So are all of these numbers too good to be true? Perhaps, but by all indications and early test drives it seems like the Fiesta ST could just be the ideal package in terms of performance, fun factor, efficiency and price.